There are many reasons 50% of the population put dental care at the bottom of the healthcare list. Some people are downright fearful while others have suffered bad experiences in the past, or some need extensive care and simply can't find enough hours in the day. It's time to rest easy. Oral Sedation Dentistry is here! Oral Conscious Sedation is a safe and simple way to significantly reduce or eliminate dental fear and anxiety. It is as easy as taking a pill! 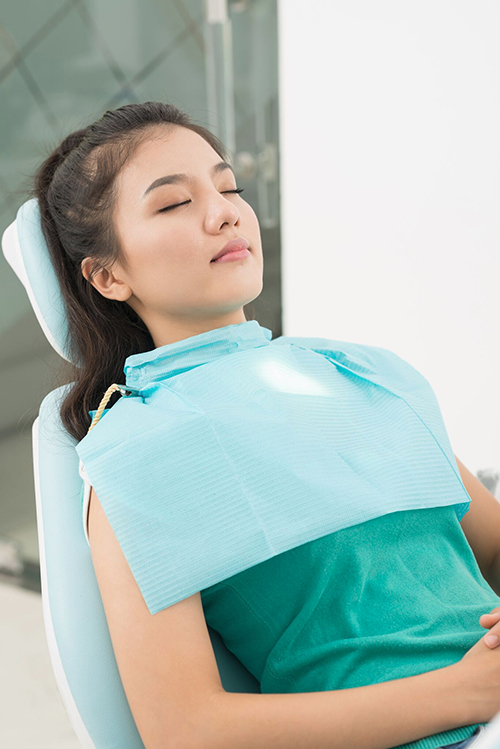 Sedation Dentistry helps eliminate the anxieties that people feel at the dental office and virtually eliminates the pain associated with dental procedures. You will be sedated just enough to be unaware of the treatment, as if you were snoozing. You will wake up with little or no memory of what was accomplished, because you were completely comfortable. Unlike General Anesthesia where a patient is completely unconscious, asleep, and unable to respond, patients under Conscious Sedation are able to respond to conversations and breathe on their own. Also unlike General Anesthesia or I.V. sedation, Oral Conscious sedation does not require needles to administer and does not have the higher fees associated with I.V. Sedation. Oral Conscious Sedation protocols have been used safely for over 30 years but were recently enhanced to significantly improve the dental experience. There are no needles required to administer Oral Conscious Sedation and you will feel little or no discomfort once you are sedated. Before starting any treatments, your doctor will review your medical history and explain how Oral Conscious Sedation can work for you and answer all of your questions. On the day of your Oral Conscious Sedation Dentist appointment, you will take the medication - a pill - and have a companion take you to your dentist's office. Experienced clinical team members are with you during your entire visit to make certain that you are completely relaxed and comfortable and continue to monitor your comfort very closely throughout your treatment. Imagine we can do years worth of dental treatments in one or two visits. Imagine being able to smile with confidence and chew your food without pain. The smile you have always dreamed of is only a phone call away!! Q. Will I feel any pain during my Sedation Dentist appointment? Q. Will I be totally relaxed during my Sedation Dentist appointment? A. You'll receive just enough sedation so that you'll be completely unaware of the treatment, as you would if you were asleep. Q. Will I be left alone after taking the Oral Conscious Sedation pill? A. No, along with the Sedation Dentist, someone will be with you throughout your entire procedure to monitor your comfort and your safety. Q. Will I remember anything after Oral Conscious Sedation? A. At the end of the treatment, you may have little or no memory of your Sedation Dentist visit. Q. Will I be groggy after my Sedation Dentist treatment is over? A. You will feel just fine. For your safety, it is required that you have a family member or friend drive you home. A. Before starting any treatment, your qualified Sedation Dentist will review your medical history, and then monitor you very closely while you're under conscious sedation.